My upbringing was not affluent by any stretch of the imagination so understand what it is like to have to do without. That being said, I had what I needed to grow up and over the years we have worked hard to give our children everything they need. Our family has fresh food everyday, clean running water, warmth in the winter and the ability to have cool air in the summer. If we are ill, some of the top medical professionals are only a phone call away and we are able to see them to receive care. The children attend very fine and safe schools. My daughter will never be thought of as a second class citizen but as a person with value. I am very grateful for my life as I am well aware that this is not the case for many families and children in this country and many other countries around the world. Choosing a word for 2015 was not something I was interested in doing. Like a New Year's resolution, it hovers over you and can have the ability to make you feel that you have somehow failed. I don't need that kind of pressure in my head or heart. Giving to others of time, love, and support comes easy to me. I get immense joy from the act of giving. I have mentioned before that last year I sadly did no sewing for charity. I did not realize how much the act of not giving had been a drain. It took the flu and being bedridden with children also with the flu for me to stop and reevaluate what is important in life. In that logo time is when my word did come to me, without reservation it will be fully embraced! My word for 2015 LOVE! Giving love through actions of kindness, through words, through charity to those less fortunate. 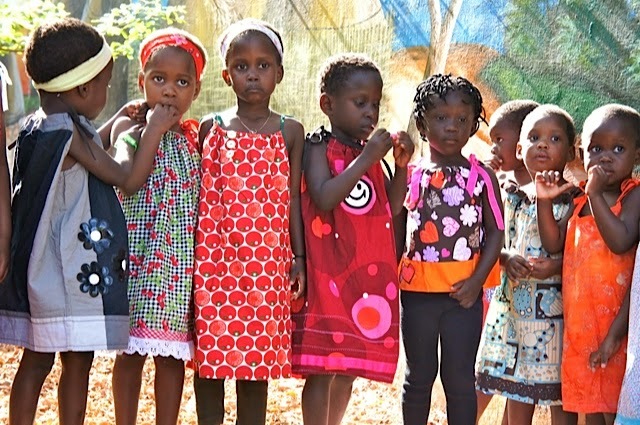 I decided to start sewing Little Dresses for Africa as one of my first projects. Amy from Amy Lou Who Sews and Angela from Cut to Pieces are joining in to make some dresses for this very amazing project! There are free patterns for the pillowcase dresses on the website. they also have patterns for Britches for Boys and reusable sanitary pads for teen girls that sadly miss many days of education because of their monthly cycle. I chose fabrics that were bright and colorful from my stash. Katy wanted to be part of the process and so we took a trip to the Local Quilt Shop and she chose some lovely batiks. I had not washed them yet so there is no photo. I had to give myself some time to become reacquainted with my serger and learn how to thread it again. Maddening machine that is completely adored when it is threaded correctly! Today I have four dresses cut out and will be ready to go! This will be #theyearofgiving. I hope you will join in with me and use the hashtag #theyearofgiving on IG ( my IG is gogokim) and twitter for any project you may be doing for charity! I'e just seen your finished dress on IG! It is adorable! A year of giving sounds wonderful too! I've read about that project before and as soon as I get the deadline projects done and out of the way, that is on my To Do list for this year too. 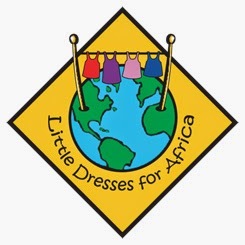 The dresses are adorable, and Little Dresses is such an awesome group! I was able to buy a high end embroidery/sewing computer at a great price two years ago, and I vowed that I would increase the number of things I did for charity, or to help out friends. The very first thing made on the machine was a quilt for a charity auction. We forget that giving blesses the giver as well as the recipient - thanks for reminding us of that! Your dresses are so darking. I love this post. It's where my heart is when it comes to sewing. I had started the new year by saying 2015 would be the year of the quilt, since I am new to quilting. But I think I would like to adopt your hashtag instead. Thank you for sharing since this is a project that is right up my alley. Many hands make light work. ***darling!!! I am so not a robot!